Custom Inflatable Structures/Tent - inflatable structure - Customized dome air structures,sport air building dome tent for tennis BY-IT-001 - Guangzhou Barry Industrial Co., Ltd.
Pressostatic textile coverings, with single or double membrane, are the easiest and most affordable system to cover and acclimatise large-area sport facilities: tennis and padel courts, football fields, swimming pools, conference halls, exhibitions, etc. 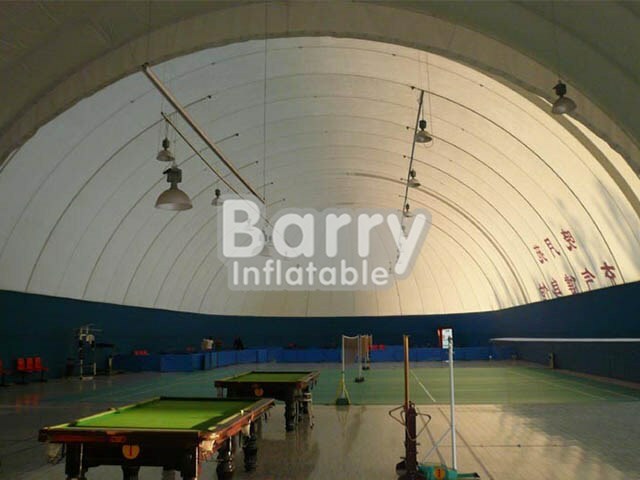 These inflatable tents respond to the need to monetise sport facilities year round, providing protection in the winter and uncovered in the summer. The principle of sustaining the static pressure consists of laying out and shaping a heavy duty technical fabric that is tensioned with a slight overpressure until it takes the required shape. 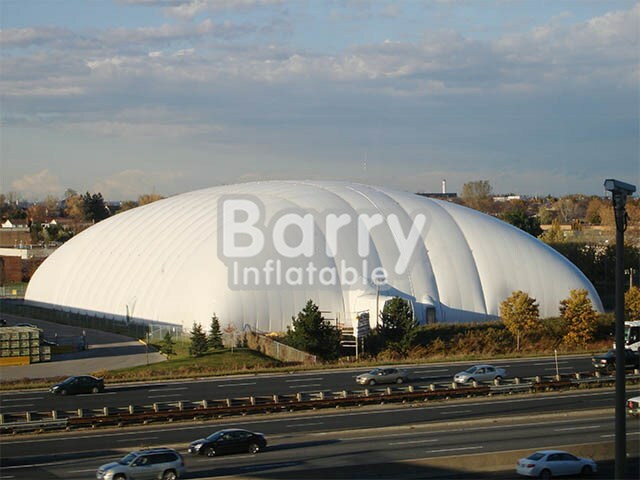 Inflatable structures have many excellent qualities, such as low acquisition and maintenance costs, easy installation and a useful life of over 15 years. Q1. What are the differences between inflatable tents and sealed tents? A: Inflatable tents are lower cost sewing products that need constant blowing comparing with sealed tents, which are using heat welding technology and only need one blow up. Q2. Can I have custom design with needed doors, windows, preferred colors and printings? A: Yes, you can. We collect a team of professional designers and are able to design the tents as requested. Of course, we always confirm the design before production, so you will surely get what you want for actual use. Q 3. How to blow up a tent? What can I do when the tent is not in use? A: We can show you how to blow up the tent and pack it when not in use. Q4. What kind of payment do you accept? Q5. How long will it take to produce a tent? Q 6. How long will it take for the delivery? A: By express and air will take about 7 days, while by sea will takes about 35 days. Q7. Are you a manufacturer or a trading company? Does your company pass any certificates? Q 8. Do you offer accessories like blowers/pumps, repair kits? A: Yes, each tent is equiped with enough CE/UL blowers/pumps(according to the electric system in your country) and repair kits. Q9. Can I check the tent before delivery? A: Yes, once the production finished, we will send you the pictures. Or you can come and make a check. Q10. How about the warranty? A: We offer 3 years warranty for each tent.